Hailee Steinfeld's Empowering "Most Girls"
Hailee Steinfeld teams up with the Grey brothers & Zedd for new hit "Starving." From Alessia Cara’s “Scars To Your Beautiful” to Beyonce’s “Run The World (Girls),” one pop sub-genre that will never go out of fashion is the female empowerment anthem. 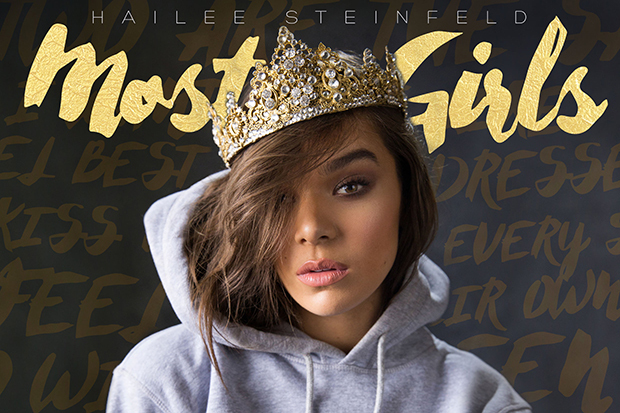 You can now add Hailee Steinfeld’s feisty “Most Girls” to your girl-power playlist. Co-produced by Ryan Tedder, Zach Skelton and One Love, the 20-year-old’s new single is a celebration of the divine feminine over club-friendly beats. “You know some days you feel so good in your own skin, but it’s okay if you want to change the body that you came in,” she ruminates in a verse. The song really takes flight in the chorus, however. “Most girls are smart and strong and beautiful, most girls work hard, go far, we are unstoppable,” the singer/actress coos. “Most girls, our fight to make every day, no two are the same. I wanna be like, I wanna be like most girls.” This is as catchy as it is relatable and inspiring. “Most Girls” is expected to be the lead single from Hailee’s debut LP (due later this year). You can stream it below.